Luton Town continued their superb away record this season with a 2-0 victory at Forest Green on Saturday courtesy of goals from Alan Sheehan and Danny Hylton. Here’s how the Hatters players rated during the afternoon. Marek Stech: 8.5 - Had to be alert in the first half as Rovers started brightly, before a wonderful save from Doidge denied the striker a certain equaliser. Redeemed himself immediately for his error against Notts County as Luton recorded a 10th clean sheet in the league already. Jack Stacey: 7 - Dismissal looked extremely harsh at first, but on second viewing, no real need to go in as high as he did to win the ball in that area of the pitch. Had got forward well in the opening period but now faces a three game ban. Dan Potts: 7.5 - Was on a tightrope after his eighth booking of the season and some thought he should have been off for a dive late in the first half, although it looked more of a stumble than anything theatrical. Made sure he kept well away from trouble in the second period too. Johnny Mullins: 7.5 - Found Doidge an increasingly difficult opponent in the first half as the striker caused a host of problems. Recovered to have the frontman on a tighter leash, although fortunate not to see red late on after reacting to what was a poor challenge on him. Alan Sheehan: 8.5 - Excellent again from the captain as he won header after header, particularly in the second half to stop any real pressure coming his side’s way. Set-pieces continue to work a treat too as he slammed home the opener from an acute angle. 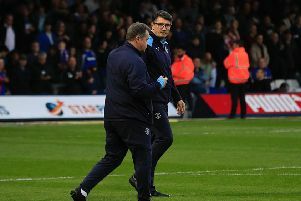 Glen Rea: 8 - Broke up play in the manner which supporters have now become accustomed as when he went to ground, timed his challenges perfectly to win the ball from his opponents. Luke Berry: 8 - Another performance full of energy and the willingness to drop back to help his side out when required. Ability on the ball saw Luton a constant threat once they won possession back in the second period too. Olly Lee: 7 - Made some good forward runs to break into the box as Town attacked in the latter stages of the first half, but wasn’t quite picked out. Kept things moving until the red saw him and brother Elliot make way for the final half an hour. Andrew Shinnie (STAR MAN): 8.5 - Midfielder was always at the hub of things for the Hatters and the main man his team-mates looked to as they tried to create an opening. A real classy operator which Luton are starting to see on a regular basis now. Danny Hylton: 7.5 - Stuck to his task well upfront as always on the heels of the keeper trying to force an error, doing just that at the crucial time with Luton having gone a man down for goal number 14 of the campaign. Elliot Lee: 7 - Plenty of effort, but only had one real attempt at goal, firing into the side-netting. Replaced once Stacey had been dismissed as Hatters opted to swap shapes for the remainder. James Justin (SUB): 7.5 - Had a real impact in the final half an hour as his athleticism on the right hand side pushed Forest Green back and back. Should get his chance now with Stacey out. Harry Cornick (SUB): 8 - Like Justin, took Town up the gears as his pace and energy gave Rovers real problems. Might have added a third as well but for a last-ditch challenge.